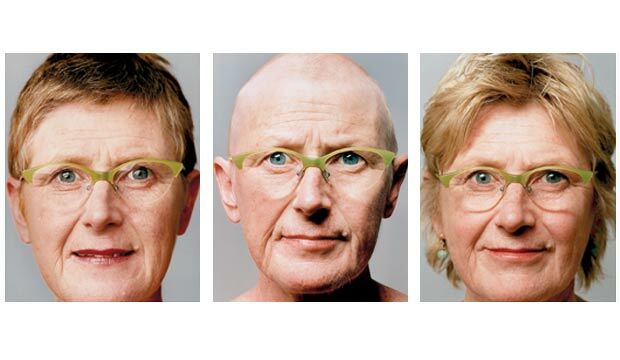 While the author’s mother battled cancer, he took portraits that reflected more than just her cool green glasses. I am an Australian, but for nearly seven years I’ve lived in New York City, photographing celebrities and politicians for American magazines. Each Christmas, when I return home to Adelaide, my brothers and sisters, aunts and uncles, cousins, nieces and nephews become my subjects. When you see people only once a year, it’s intriguing to notice how much they’ve changed. In 2001 I began a series of portraits of my mum, Rochelle Woodley Baker, wearing these cool green glasses. Four months after I took the first photographs, a large lump appeared on Mum’s neck. She checked into the hospital, where Hodgkin’s lymphoma was diagnosed. Mum had never been hospitalized before, except to deliver her three children. By my next trip home, at the end of 2002, Mum was well into chemotherapy. She was reluctant to be photographed, but she went along, knowing that photographs have been central to my life since she and Dad gave me my first camera—a Canon TLb—when I was 13 years old. The mood of our 2003 session was altogether different. Mum had passed her three-month checkup and has been clear of cancer ever since. In this series of photographs, I can see the impact of Mum’s illness. Her eyes have lost some sparkle, and her body has filled out. But she has changed for the better too. She left her government social planning job to create her own social planning firm, which reports on community health issues. She’s worked with women in remote rural communities in India and Bangladesh. And she won a scholarship from the University of South Australia to work on a Ph.D. in education policy. In the past, she would have deliberated over those things for a long time. Mum’s far more decisive now. Mum has been brave about my photographing her, and she’s happy I’m taking the pictures. But she doesn’t want to look at them much.